While using social media sites especially Facebook and twitter, you may come across some of the users whose activities may irritate you and you want to get rid of them or simple do not want to see their activities at your time line. Although Facebook has option to unfriend or block the activities of these users at your timeline, but the this option was not available at world’s second largest Social media site Twitter. But now twitter has introduced this function through which the user can stop unwanted tweets easily on their windows and smartphones by using Mute button. 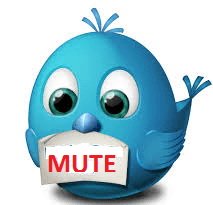 The most interesting part of this Mute button is the other user will not notify that you have blocked its tweets. Also you can stop the tweets of that person also that you not follow. Although the simple solution is to unfollow that person, but by doing this the person will get notify so here is the simple and one click solution to use mute button function. Sign in to your twitter account and go for the user whose tweets you want to stop. Click on the user name of that person and wait for the new windows having twitter profile. Click on the gear icon and next on the mute. Just repeat step 1 described above and moves your pointer to “more” option. Click at the mute option in the drop down. So you have done, you can un mute the user easily whenever you want.